If you are looking for other choices such as ‘value for money‘ or ‘budget accommodation‘ rather than just the cheapest then click here: PE Budget Accommodation. For the purposes of this exercise we only considered ‘per person sharing‘ rates amongst these accommodation types: Self-catering, Bed and Breakfast, Guest Houses, Hotels, Lodges, Boutique Hotels, Backpackers and Country Houses and excluded caravan and camping sites. From R110.00 per person: Donkin Heritage B&B – Step into history when staying in the Donkin Heritage B&B. You can just imagine a pomp of English soldiers living here almost 160 years ago.Situated in Port Elizabeth Central, Donkin Heritage B&B aims to fulfill the needs of the budget-conscious visitor. The B&B offers comfortably furnished rooms that include single, double and dorm rooms. 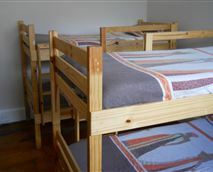 The rooms are furnished with comfortable single, double or bunk beds and share the use of a bathroom. Guests can enjoy a hearty English breakfast in the morning and home-cooked dinners are available on request. Guests can also make use of the kitchen which is equipped with a stove and oven, a microwave and a fridge-freezer. Relax in the lounge which has a TV with the smaller TOP TV bouquet. The lounge opens onto the dining room which has a fireplace and in turn opens onto the back courtyard. Wi-Fi access is also available to guests. Group books are welcome and discounts may apply. Port Elizabeth offers guests a variety of attractions and activities to keep the whole family entertained. Guests can relax on the beach, go surfing, cycle the Baakens River mountain bike trail, visit the historical lighthouse or experience one of the excellent walking trails in the area. From R110 per person: Cora Terrace – Why Cora Terrace? Not often will you have the opportunity to stay in a National Monument! This beautiful Georgian home was built in the 1850’s to house soldiers guarding the port of Port Elizabeth. Situated in picturesque surroundings, you can walk to the Old Fort, the Donkin Memorial and St. George’s botanical gardens. It is about 5 minute quick drive to the beach. For the sporting enthusiast, it is within walking distance to St. George’s cricket stadium, and about a 10 minute drive to the new Nelson Mandela Bay Stadium.Accommodation ranges from private twin and double rooms, family rooms, and dormitories. Bathrooms are communal as no bedrooms are en-suite. We have self-catering facilities suitable for the individual and group. Alternatively, why don’t you rather let us prepare the meals? On request we offer home cooked meals that can be adapted to your requirements. Do you want guidance on activities when in Port Elizabeth. Once your booking is confirmed, we will help you design activities to make your trip to Port Elizabeth exciting and memorable. This is at no additional cost, although you would need to pay relevant entrance fees where required. Should you wish to have guided tours, we will also put you in contact with local, registered specialists. Remember to book early in advance as we do get busy during school terms and during events. We regret that due to the stairs, physically disabled guests cannot be accommodated. From R120.00 per person: The Hippo Backpackers – The Hippo Backpackers is an owner-managed lodge situated on Richmond Hill in Port Elizabeth. 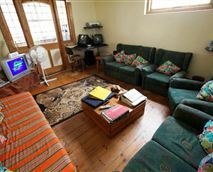 Homely and hearty, the Hippo is located in a central area of town, within easy reach of trendy restaurants and pubs.The Hippo Backpackers offers accommodation in three six-bed dormitory rooms, three twin rooms and two double rooms. The twin and double rooms contain en-suite bathrooms. The Hippo Backpackers features braai facilities, a swimming pool, a pub and entertainment area with a pool table and DStv. We have a laundry service, and broadband Wi-Fi internet connection. Secure parking is also available. From R140 per person: Lungile Lodge – Lungile Lodge in a luxurious beachfront backpackers that boasts hight standard facilities and is only 3km walk from the beach, entertainment and nightlife.Definitely one of the most upmarket and homely backpackers in the country with a perfect location and great vibe! Activities nearby include:· Tours to scenic resorts and game parks – including Addo Elephant Park, Shamwari Game Reserve and Schotia Lion Park. From R150.00 per person: Den Nay Cottage – We offer a lovely one bedroom cottage with a lounge, bathroom and kitchen in a quiet neighbourhood, situated in Sherwood, Port Elizabeth.Features: DStv, Shower only, Air-Conditioning, Fireplace, Self-catering, Sleeper couch, Single beds, Television, Radio, DVD player, Tea and Coffee Facilities, Safe, No Smoking in Rooms, Hair Dryer. 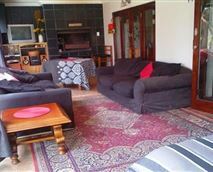 Den-Nay Cottage is 0.3km from the centre of Sherwood (PE) , the nearest airport 15.1km (Port Elizabeth Airport). From R175.00 per person: Sunset Guesthouse – Sunset Guesthouse is a homely accommodation establishment set in the lovely area of Summerstrand. 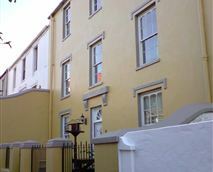 It offers luxurious double or single bedroom accommodation.Our five tastefully decorated suits vary in size and layout. All guest house rooms have luxurious furnishings with bar fridges, microwaves, TVs and tea and coffee facilities. We guarantee great comfort in a relaxed atmosphere. There is a tropical garden with a sparkling swimming pool and a braai facility. Full breakfasts are included in the room rate and dinners can be arranged. Wi-Fi Internet and laundry facilities are also available.We are close to the airport, main beachfront, the Boardwalk Casino Complex, shopping centres and restaurants. Jeffery’s Bay is 60 km away and we offer transfer facilities to the airport on request. Sunset Guesthouse is 0.9km from the centre of Summerstrand , the nearest airport 5km (Port Elizabeth Airport). From R190.00 per person sharing: Villa Delphi – Nestled and the end of a quiet and tranquil cul-de-sac, in the historic centre of Port Elizabeth. Villa Delphi is one of Port Elizabeth’s best kept secrets. Offering secure, comfortable and budget accommodation, this newly renovated cottage is over a century old. Close to all the main amenities, we are a ten minute drive to the beach front and casino complex and cinemas. The large shopping malls are approximately 15 minutes away. And a 10 minutes stroll up the road will take you to St. Georges Park our beautiful Art Gallery and Rink Street which houses all the main banks, in addition to dry cleaners, bakery, and various other small shops. There are many interesting, coffee houses, restaurants and cafés, as well as antique shops in this area. The Villa comprises of four unique apartments each with their own entrances. All linen is changed once a week, and bath linen twice a week during stays for longer than seven days. The apartments are serviced once a week. All bedrooms have television. The Villa Delphi Cottage has two bedrooms each with two single beds (four beds in total) one bathroom and has a well-appointed kitchen fully equipped with a two plate stove, fridge and microwave in addition to all necessary glassware, crockery and cutlery. Each Bedroom has a TV. The other apartments offer limited self-catering facilities with toaster, microwave, fridge and kettle.All apartments offer facilities for the preparation of light meals. Villa Delphi is 0.4km from the centre of Central Hill , the nearest airport 2.7km (Port Elizabeth Airport). From R200.00 per person: TyDay Cotswold Guest House – TyDay offers accommodation in a four units and is located in the heart of Port Elizabeth near all the local attractions, shops and beaches.When booking at TyDay guests have a choice of booking the Studio Unit, the Base Unit, the Bachelor Unit and the Backpacker Unit.The Studio Unit, the Base Unit and the Bachelor Unit each contain a well-equipped kitchenette with a microwave, a fridge, a two plate stove as well as cutlery and crockery and can sleep between two to three people. All four of the units have a TV with DStv Bouquet as well as a private entrance with parking behind a remote controlled gate. The property has a swimming pool ideal for those warm summer days when the beaches are too busy. Please note that the rates displayed for the Base Unit, are for two guests and the third guest will pay an additional amount; hence we advise guests to request the appropriate tariffs. See the first article: Top 5 Port Elizabeth vs Cape Town Accommodation Rates. From R45 per person: Riverlodge Backpackers – Riverlodge Backpackers offers self-catering backpacking accommodation ideal for for volunteer accommodation, individual and group bookings as well as overland tours. The budget self-catering accommodation consists of single, double and twin rooms and we are the only backpacking lodge in Cape Town offering two campsites, for vehicles and tents, located securely within our gardens.We also have a backpacking travel desk, and one of our friendly and knowledgeable backpacking staff will be able to assist you with planning every aspect of your trip. Our exciting Cape Town adventure tours range from, Table Mountain tours, Great White shark cage diving, whale watching, penguin kayaking tours, township tours, Wineland tours, scuba diving excursions, reef and wreck diving or diving in the astounding predator tank at the aquarium.Some more interesting activities at Oude Molen Eco Village especially for backpackers include horse riding on the estate from the on-site stable and walking around the wetlands. From R50 per person: Cape Town Deco Lodge Backpackers – Cape Town Deco Lodge Backpackers is 1.9 km from the city centre, between the University of Cape Town and Cape Town itself. Our philosophy is to offer distinctive accommodation in a relaxed atmosphere. Deco Lodge reflects something special about the local colours and flavours of the city.We offer you a comfortable bed with crisp and clean linen for a peaceful sleep. Our staff is attentive, friendly and filled with the easy-going spirit of Africa. Guests have access to a beautifully green garden with pool, Internet facilities, a fully equipped kitchen, a braai area, a billiard room, a TV room and a laundry service. This is the place to meet interesting local and international visitors, many of whom stay for extended periods of time.The surrounding area is bursting with character, especially for the restless and adventurous. Cape Town sprawls at the foot of Table Mountain and its attendant summits, Devil’s Peak and iconical Lion’s Head. We are ideally located for wine tours and trips to the beach. From R75 per person: Eco Wave Lodge – Eco Wave Lodge offers affordable budget accommodation in a modern and stylish two-storey mansion located in the heart of Kommetjie, a mere stone’s throw from the beach. Whether you are backpacking across South Africa in search of that perfect wave, or just want to relax on a budget in one of Cape Town’s most beautiful areas, Eco Wave House is the place to stay. 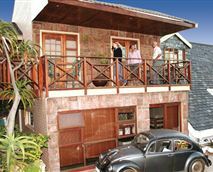 Apart from quaint restaurants and pubs, a surf shop and a grocery store are all within a short stroll from the house.Eco Wave house is designed to offer guests a bright and friendly atmosphere with various balconies specifically constructed to take advantage of the majestic views of the sea and the village. The house also has barbecue facilities and a small garden to relax in. If you feel like cooking, the fully equipped kitchen is ready to be used. In addition, the house offers a large living area fully equipped with TV, a pool table and comfortable couches. Unlimited Internet usage is available for a small fee and a washing machine is available on request. The house offers four bedrooms, with modern and clean shared bathrooms.Kommetjie is a picturesque suburb situated just south of Cape Town on the Southern Peninsula, a mere 40-minute drive from the centre of Cape Town. Here, on the plain of “The Cape of Good Hope”, stands the remarkably well-preserved rural area of Kommetjie, which has maintained a peaceful and relaxed atmosphere throughout the years. Straddling the coastline, Kommetjie’s main attraction is certainly the smooth, soft and sandy Long Beach. Extending over 8 km and offering stunning views of nature at its wildest, Long Beach is the perfect location for slow strolls, brisk horse rides, or frantic surf sessions. Indeed, Kommetjie has gained its reputation as one of South Africa’s hottest surf spots, a gem within short walking distance from the Eco Wave House.The Southern Peninsula also boasts other well-known attractions. In just 20 minutes you could be driving along the world-renowned Chapman’s Peak Drive between Hout Bay and Noordhoek, visiting one of South Africa’s oldest towns, Simon’s Town, with its large breeding colony of African Penguins, you could be dining and shopping at the bohemian Kalk Bay, or taking in the sights at Muizenberg with its pastel-colour beach houses. Over and above this, Kommetjie lies well on the way to Cape Point and the historic Cape of Good Hope, both of which offer great hiking and mountain biking trails with unparalleled views on the surging Atlantic Ocean and its prime surf spots. From R80 per person: Amber Tree Lodge – Amber Tree Lodge offers intimate and stylish backpacker-style accommodation for travellers wanting to experience the true heartbeat of the Mother City. Located in the trendy Cape Town suburb of Tamboerskloof, Amber Tree Lodge has quickly built up a reputation as one of the city’s best backpacker-style lodges.With limited accommodation for up to 20 people, Amber Tree Lodge provides a warm, friendly, and relaxed atmosphere. Guests can choose between backpacker-chic dorm or deluxe rooms, while the well-appointed guest facilities such as spotless bathrooms, spacious showers, quality linen, and comfortable beds immediately make you feel at home.We are a mere 10 minutes’ walk away from the heart of Cape Town’s business and shopping district, but if exploring the area on foot is not your thing, then public transport is also easily accessible. Amber Tree Lodge is close to the best restaurants and cafés Cape Town has to offer, as well as the centre of Cape Town’s vibrant live music and entertainment venues. Cape Town’s top tourism destinations are all within a short travelling distance from our doorstep.With magnificent, sweeping views of Table Mountain from our second-floor terrace, Amber Tree Lodge is the perfect base from which to create your travel memories. Amber Tree Lodge also provides an eco-friendly environment, with solar geysers, energy-saving bulbs throughout the lodge, and a recycling system for kitchen waste. 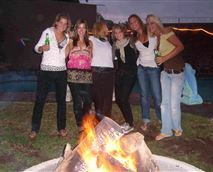 From R85 per person: Lighthouse Farm Lodge & Backpackers – a Backpacker in Mowbray. Beautiful site with open fields and river with views of Devils peak and Table Mountain. The rooms are doubles and quads (bunk beds) with Oregon pine floors and lockable cupboard space. Self-catering kitchen with all amenities. Besides a full range of tours available we have horse riding, beautiful walks along the rivers, pathway connecting to Rhodes memorial, Devils peak etc.Plenty of on site parking, full security, meals available, computer and email service. Double rooms from R200 and dorm beds from R90 per person per night.Lighthouse Farm Lodge rocks! – Me and my husband enjoyed our stay at Lighthouse Farm Lodge. We are definitely thinking of going again very soon. It is nice and quiet if you want to have your own time and the owner, Helen, is so welcoming. I enjoyed every minute. From R90 per person: Navine’s Homestay – Navine’s Homestay is for non-smoking travellers, backpackers and value-conscious tourists who prefer a home environment rather than a hotel. This home is for single, unattached, travellers. Navine’s Homestay offers three clean, simply-furnished bedrooms with a shared bathroom. We offer a fully functional kitchen including a coffee and tea-making facilities and a washing machine. There is a balcony, and pleasant space for barbequing.Parking is inside and very secure. Whatever your reason for visiting Cape Town, Navine’s Homestay is the perfect venue to enjoy the magnificent beauty of the city and become part of the local community. It offers lots of space and privacy, and is perfect for travellers who want to sleep, relax and re-charge their batteries. It strictly one person per room at all times. Plenty of meeting space is available in other areas of the home, for social gatherings.The owner lives upstairs while the three bedrooms are downstairs. By car, the home is 30 km from the city centre, and 25 minutes from the airport. It is clean, comfortable, and safe. It is close to the well-known Kenilworth Racecourse which is 10 minutes away as well as the Royal Cape Golf Club in Ottery.Muizenberg beaches are 20 minutes away, as well as Constantia Valley with the country’s oldest wine route and mountain walks. The Constantia Mountains are visible from the balcony, which offers relaxing views throughout the day. For those with no car, public transport is a 10 minutes’ walk away and busses and taxis run to Wynberg, Claremont. At night the area is very, very quiet. For those want to go out at night, Swingers club/pub is a 15 minutes’ walk away, and there is a very basic sports bar opposite it. Also 15 minutes from Navine’s Homestay and close to Swingers, you will find Fuzion nightclub, very local in character located in a light industrial are, not fancy but fun! Next to that club is a pool bar, called Massimo’s. You can either walk there at night or if you wish, ask the owners to organise a taxi ride home. For those who wish to experience local cultures, this home is at a transport junction to the black townships mainly inhabited by Xhosa-speakers. Afrikaans language communities are about 10 minutes away, on the Cape Flats. Many other local and African communities like Malawian and Zimbabwean reside nearby, each with their own unique customs. By taking public transport you will meet these people, who are always open to a conversation. With the guidance of the owner, you will be able to access community projects some 15 minutes away from the home, if you wished to get involved with South African development issues. Some guests have obtained their international driving licences at the nearby traffic departments which is 10 minute walk and have benefited from the many driving schools in the area. Others have come to improve their English-language ability and have attended the nearby English Language home school, a cost-effective and community-based alternative to commercial operations. Our guests also enjoy the tasty, inexpensive and clean food sold at outlets within walking distance from the home. Cape Malay and Indian are the predominant styles breyani, stews, curries, braais, and fish. You are most welcome to cook at home and enjoy social time with the owner, who also enjoys cooking together. From R90 per person: Simonstown Boutique Backpackers – Simonstown Boutique Backpackers is situated along the main road in Simonstown and is based in the Historical Prince Alfred Building Est. 1802. Simonstown is a charming naval town named after the governor of the Cape Colony, Simon van der Stel, upon whose recommendation the Bay was used by the Dutch East India Trading Company for winter anchorage.The backpackers offers a number of different room types to accommodate your specific needs. Come spend some time on our huge sea-facing-people-spotting-action-watching balcony – a great spot from which to soak up the view whilst knocking back a beer or two.Simonstown is a good deal quieter than Cape Town itself, so if you’re all partied out or just want to relax in peace and tranquility, then it’s a great base for your holiday. We have no parking hassles and no crime problems and the centre of Cape Town is only 45 minutes away by car or just over an hour by train. You can reach all the great sites of Cape Town easily and the beauty of Cape Point at the Cape of Good Hope, the Cape Peninsula and the famous Penguins of Boulder’s Beach is right on our doorstep.We’re conveniently located in the heart of Simonstown and just a 10-minute walk from the railway station. We can also arrange airport transfers, bicycle rental, Cape Point, Overland, Wine, and Garden Route tours, shark diving tours, boat trips, and car hire. From R100 per person: Cheval Vapeur – In the heart of Cape Town’s seasonal wetlands, Cheval Vapeur Horse Farm is a wonderfully tranquil oasis and a nature haven for those who still need to be close to all Cape Town’s attractions; such as Table Mountain, Groot Constantia, Newlands Cricket and Rugby as well as various great restaurants and the southern suburbs.The rustic wooden Cottages are idyllically situated overlooking the dam with flourishing bird life and serene paddocked horses. The Cottages can sleep between four and six people and is comprehensively equipped. Linen can be supplied at an additional cost of R10 per person. A separate ablution facility containing a toilet, a shower, a bidet and a hand-basin. A barbecue area, children’s playground as well as a row boat for access to the small bird island is also available.Cheval Vapeur is fully secured with private 24 hour armed response, electric fencing, night security guards, dogs and resident owners.The horses at Cheval Vapeur, are trained in natural horsemanship and dressage and jumping arenas, lungeing rings, potter paths and out rides can be enjoyed. Various bird species such as Moorhens, Comorants, Egyptian Geese, Krakes, Sacred Ibis, Hadedas, Cootes, Malakite Kingfisher, Dabchicks, Darters, Hammerkop, White Faced Ducks, Yellow Billed Ducks and many more reside on the property. There is also a substantial community of Western Leopard Toads. Located within a short drive is the Ottery Hypermarket, Macro and located within a 10 minute drive is the Royal Cape Golf Club and the Zeekoeivlei International Bird Sanctuary. Wynberg, Kenilworth, Plumstead and Muizenberg Beach are within a 15 to 20 minute drive. A bit further away is the Stellenbosch wine routes and Atlantic Ocean and approximately 60 km away is the Cape Point Nature Reserve.